It has been a week since I bought passion fruits from the Hillcrest Farmers Market. I was happy to see the purple skin becoming brittle and wrinkly, which means they are ripe and ready to be eaten. Passion fruits bring back fond memories of my rotation in Vietnam. For lunch, I frequented a local restaurant walking distance to the pharmacy school, where I was introduced to passion fruit, or “chanh day,” for the first time in my life. I still remember my first sip, an intense flavor, both sweet and sour, hitting my taste buds, unmatched by any other fruits. I would enjoy a bowl of banh canh and a glass of “chanh day” while taking in the crowd, motorcycles zooming by, and the hot, humid weather of Saigon. Ever since I came back to the states, I have not been able to find passion fruits until this fall. Passion fruits are only available in early spring through summer so I definitely hit the jackpot. I was wavering between passion fruit mousse, sorbet, or crème brulee. 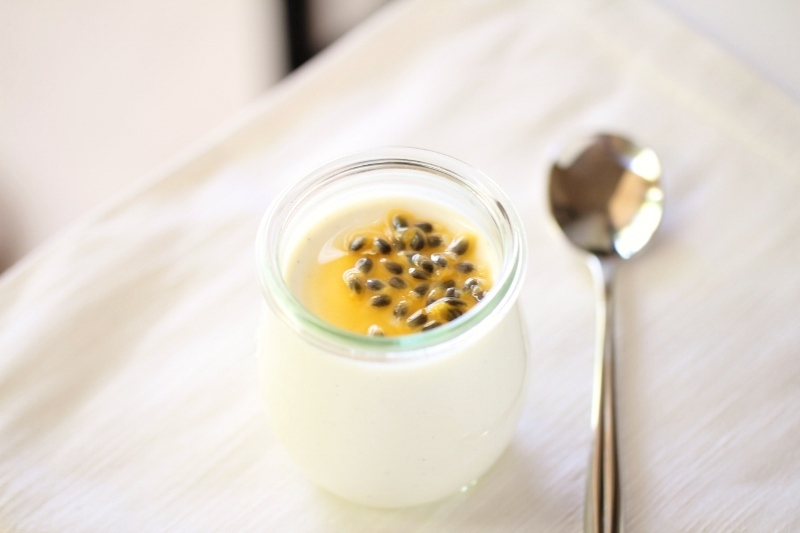 In the end I went with something unexpected, panna cotta, an Italian dessert, and used the passion fruit pulp as the topping. What an amazing combination! 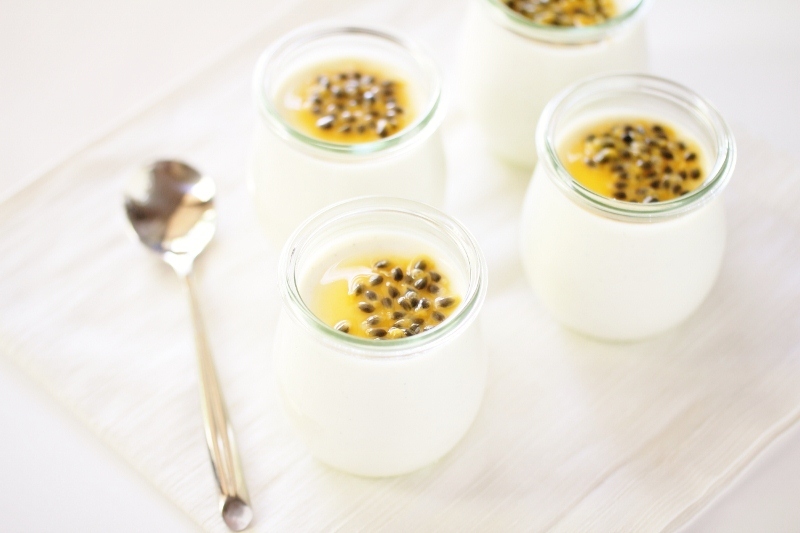 The intense flavor of the passion fruit complimented the lightness and delicate taste of the panna cotta. The seeds added a wonderful crunch. It was a perfect dessert to end the weekend. I am looking forward to growing my own passion fruits one day! 1. Place the water in a small bowl and sprinkle gelatin over the surface. 2. Combine sugar and cream in a saucepan over medium heat and whisk until the sugar is dissolved. Add in the vanilla bean paste. 3. Stir in the gelatin until dissolved. 4. Add the buttermilk to the cream mixture and continue whisking. Allow the mixture to boil for 5 minutes. 5. Remove from heat and strain the mixture into a container. 6. Pour the strained mixture into jars just to the base of the neck and refrigerate for 6 hours or until set. 7. 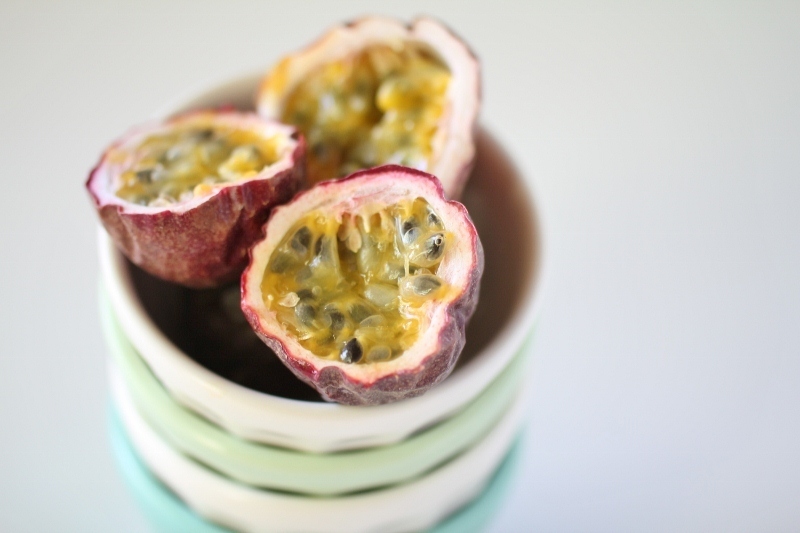 Serve with passion fruit pulp.